It's bedtime and Lola's fuzzy, warm and snuggly blanket is missing! Lola can't sleep without her blanket. In this heartwarming story, Lola knows she is getting older and it may be time to give away her first "blankie." But after it goes missing, she knows she needs her blanket more than ever! Even though she misses it badly, Lola has grown so tall, her feet now stick out from under her blanket, leaving her toes exposed and cold. But just her thinking about wrapping herself up in her cozy little cover brings special memories - reminding her why she is not ready to let it go. 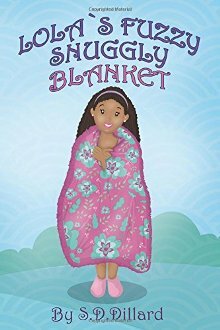 Follow Lola on her search to find her missing blanket and learn why it is so very important. A fantastic bedtime story, illustrated with colorful pictures and large print for the beginning reader. Lola's heartfelt journey is wrapped inside a book for everybody who knows how something special can give you that warm, fuzzy feeling inside.